Blimburn Seeds are well-respected breeders in the cannabis industry, who are known for their clear focus on crafting high quality feminized marijuana seeds. Their experience comes from 16+ years of study, cultivation and breeding. 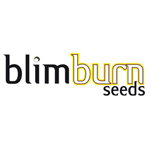 Blimburn Seeds focus on three key areas - taste, production, and stability. Every single strain is extremely powerful, exceptionally productive and off-the-hook tasty! Blimburn never re-package seeds, and only distribute stock that has been packaged in the past two months to ensure their seeds are fresh and sure to yield spectacular results.